So many delicious salad creations come from being hungry and going to the kitchen to make lunch and finding the fruit or veggies I planned to use are gone because someone took them for lunch, the produce is bad (doesn’t happen that often), or the darn avocado or fruit isn’t ripe. Sometimes it’s one of those use up what we have left situations and try to throw something together. I’m not really sure what I was thinking the day this combo was created. All I know is I went to the kitchen to make a salad and then saw the juicy plums sitting there and wanted plums, yogurt, and honey instead. I kept on the path of making a salad and we were out of spinach and I wasn’t in the mood for arugula. We had a few cucumbers to use up and some ripe avocados and I would have paired those with grapefruit but we didn’t have any of those and those darn plums were still starring at me! So added those in and of course the honey, which is optional, and for a little freshness the mint leaves. It was a delicious combination! So yep I made it again the next day, still good, so I decided I had to share it. Breakfast, lunch, or dinner this salad will hit the spot! Yes I said breakfast, if I’m going to have a salad for breakfast it is packed with fruits and veggies but no greens/lettuce. Don’t forget it’s Monday, Meatless Monday! Join my co host Deborah and I by linking up and sharing your favorite meatless eats or check out what others are posting below for more inspiration! Slice cucumbers in 1/2″- 3/4″ slices, cut the slices into quarters and put into a bowl. 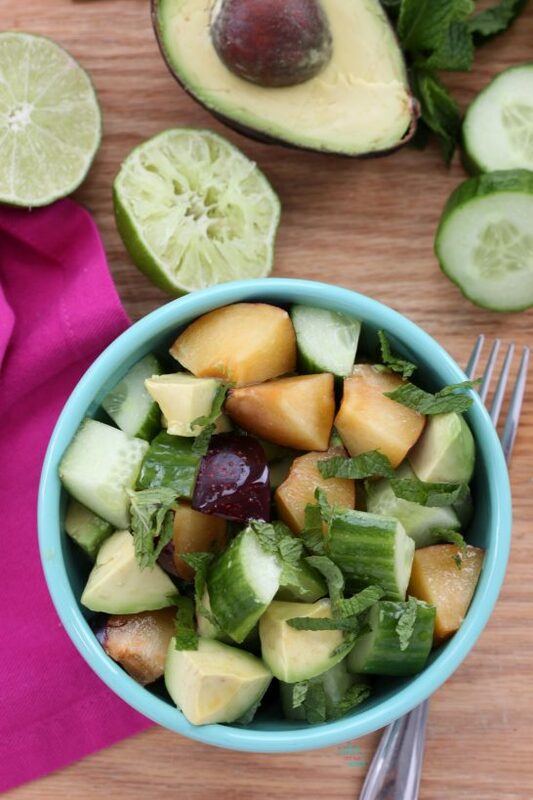 Cut the plum into 8th’s and remove pit, cut the slices in half and add to the cucumber. 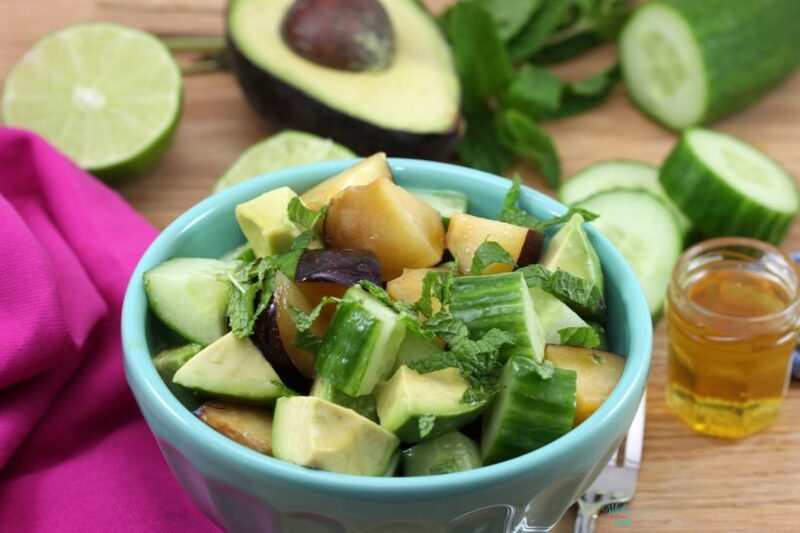 Cut the avocado half into cubes, cut the lime in half and squeeze lime juice on the avocado and then on the plum and cucumbers. Toss the cucumbers and plums with the juice. 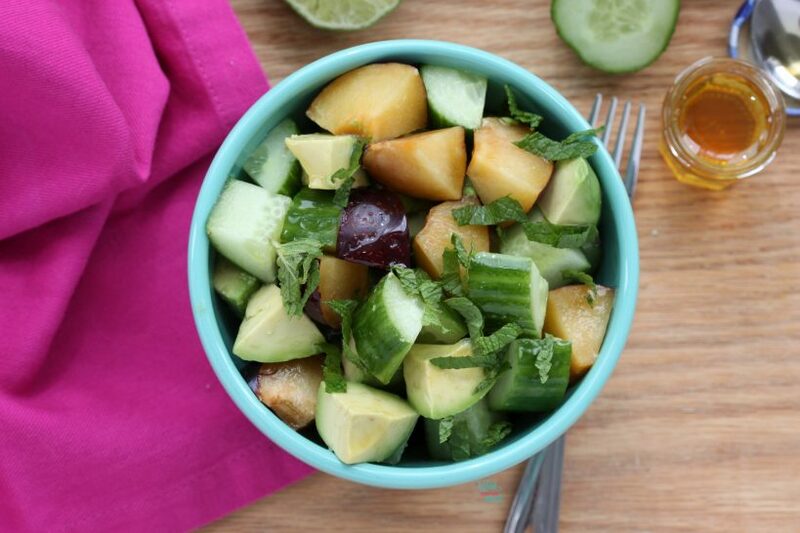 Add in the avocado and gently toss with the plums and cucumber. Place into bowl or plate to serve if you didn’t have a bowl big enough to make it in. Drizzle with honey and top with sliced/ torn mint leaves. Enjoy! Sharing and spreading all the Meatless Monday love I’m also linking up with The Fit Foodie Mama and Running on Happy for their Meatless Monday link-up! What a yummy salad combination. I love chunky salads like this time of year! Thank you Julie! 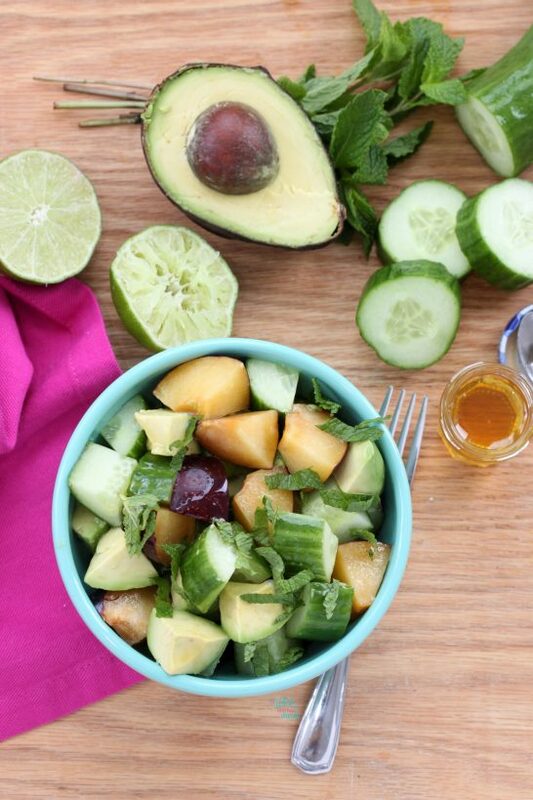 I’m all over all the salad, especially ones packed with all the veggies, fruits, and flavors this time of year! What an awesome and yummy combination! Perfect for summer! You always come up with such cool ideas. I would never have thought to put a plum with cucumber together but it sounds really refreshing. Mary Ellen @ VNutrition recently posted…My First Healthy Vegan Fridays! Thank you Mary, it is such a delicious fresh combination. Sounds fun I’ll be linking up this Friday! Still have not gotten my hands on good plums yet…but they’re coming!!! Rebecca they are still hit or miss depending on where I find them but I know they will only get better! Thank you Deborah! Yes we got some good ones and bad ones but I know the best ones are still to come! I have a really hard time finding halfway decent plums in my area. When I was a kid we used to get them all the time and they were amazing. I need to find them again! They are just coming and hit or miss. We got a really good batch but I know the best are still to come. They still aren’t anywhere near the amazing ones we had in Ireland. My youngest and I ate a few a day for a month! Just wait very soon you should be able to get lots of good ones. What a great combination! I never think to add plums to my salads, which is a shame because I bet it’s amazing! Thank you Courtney! You will definitely have to add them soon! Thank you for linking up with us! I’ve never combined plum with avocado or cucumber. I bet it’s delicious! It is, you’ll have to try it! 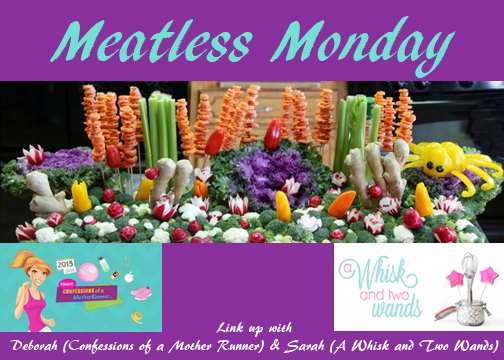 Thank you for linking up with us for Meatless Monday! Well this just looks delicious! Yum! 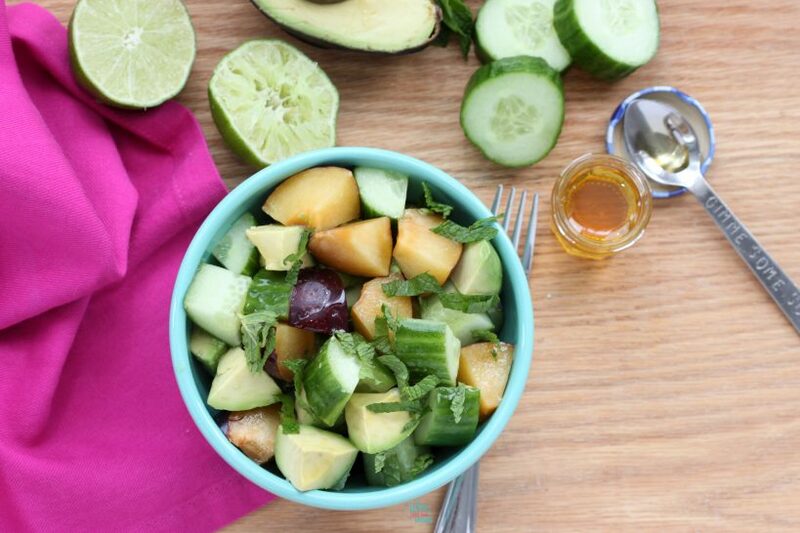 I love the way melon and cucumber go together, great recipe Sarah! Thank you Heather! It’s such a delicious refreshing combo! Thank you! So fresh and flavorful, hope you enjoy it!